This week's Diva Challenge involved just one pattern. The pattern is called All Boxed Up and it's a fun pattern to play around with. Here is how to draw All Boxed Up. It's a simple pattern but there are so many iterations of this great pattern. 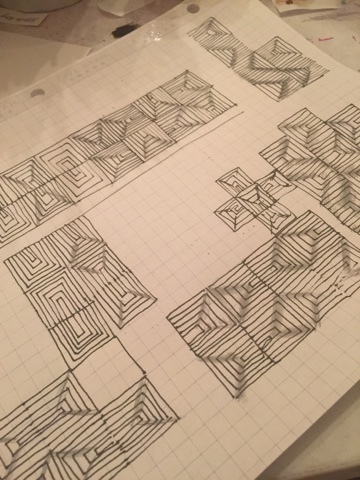 So I played around with different combinations, turning the pattern as I drew, shading certain parts. As I was playing with the pattern, I recalled that another challenge I signed for had me drawing a chevron. 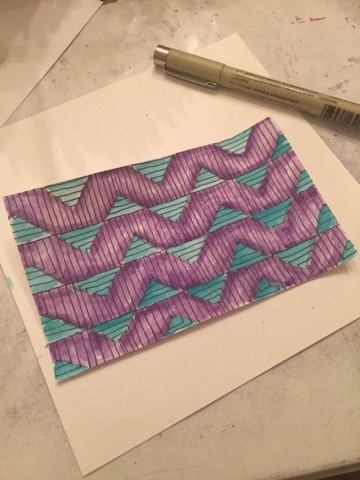 This is a fun challenge where you draw or color an index card everyday. 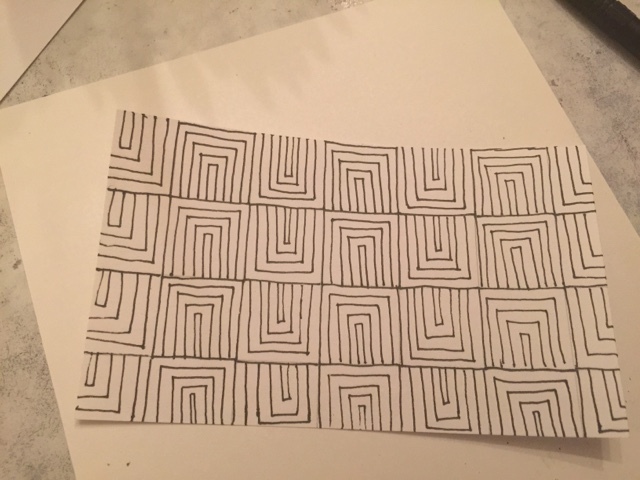 In one of my practices, the way the pattern was shaded, it looked like a zigzag pattern. Take a look at the index card before it was colored or shaded. It looks nothing like the finished product you see above! I love patterns like this where it can be transformed into different 'looks'. I hope you will give Zentangle a try. It really is relaxing once you get going. Have a great Tuesday! I really like the way that you show, not only your lovely completed piece, but the work that went into designing it. How fun! Thanks, Suzanne! I enjoy seeing people's process as well as their products so I try as best I can to explain my process. I'm glad you enjoyed that! I love how you really played with it before committing to a final selection. I admire that more than you could know! It turned out so beautifully! I am really enjoying the sampler you did of different ways to draw All Boxed Up. Then the color on your final tile gives it an entirely different look. Very cool. Thanks, Suzanne! I've been experimenting with color in my ZIA. Most of the time, I use muted colors but I was inspired to use bolder colors this time! Beautiful!!! Thanks for showing us your work on this tangle. Nice to see the process, the result is beautiful! Wonderful to see the process, and to see how colour makes it look like a totally different tangle, in some ways. Nicely done! So many creative ways you went! Color, shading and form. Great work. They are beautiful. Sarah. Terrific Post. It is so interesting to see how your colorization added to the challenge patterns look. Well done. What a beautiful result with fine colourling! Thank you for showing the process, too!